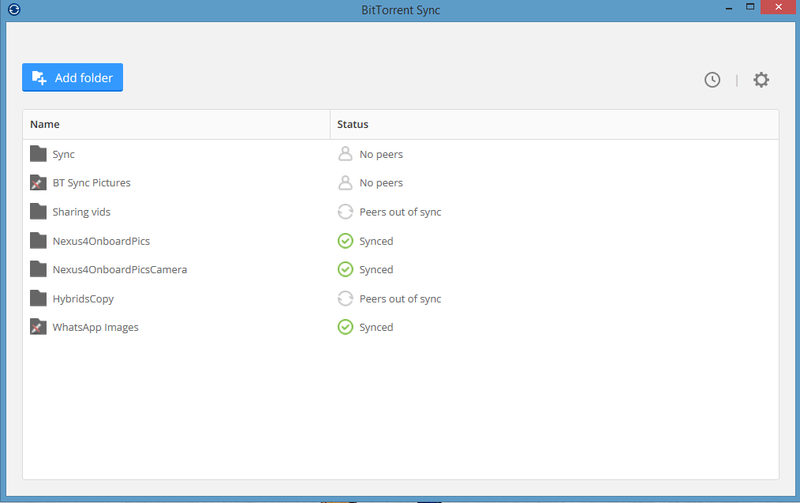 BitTorrent Sync offers an enticing promise: share any folders you want across all your devices using peer-to-peer networking—no cloud necessary. And people are buying into that promise, according to BitTorrent, with more than 10 million installs of the app and 80 petabytes of data transferred. Despite the promising early numbers, however, early versions of Sync were a little confusing to use for non-power users. 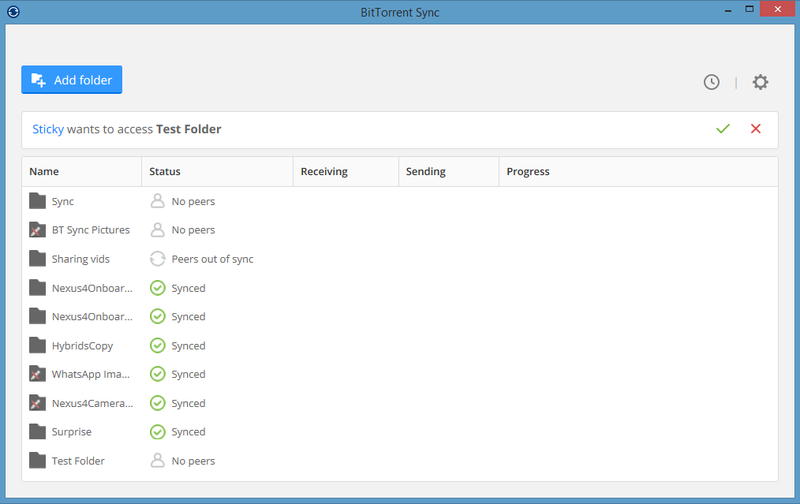 That changes on Tuesday with the introduction of BitTorrent Sync 1.4 Beta for Windows, OS X, Linux, Android, iOS, and Windows Phone. The newest version of Sync is a giant leap forward in usability thanks to its improved sharing capabilities and much needed visual overhaul. I've been using Sync 1.4 for a few days. Here are my initial impressions using the new app on Windows 8.1 and Android. The basic Sync 1.4 window. The first thing you notice when you fire up Sync 1.4 on Windows is how much better it looks than previous versions. The utilitarian, rudimentary tabbed interface is gone and replaced with a non-tabbed flat design in line with the Windows 8.1 design aesthetic. By default, the new Sync window shows two columns: folder names and sync status. Click on the settings cog in the upper right corner and select Preferences to add other columns with additional information such as receiving, sending, progress, path, size, date added, date synced, and peers. Sync 1.4's global preferences window. You should also note at the top of the general preferences window there are three key bits of information you should know about: your user name, the device name, and the device's fingerprint. All three pieces of information are meant to help others identify you (more on that later). Most users probably won't bother with these settings, but the security conscious among you will want to take note. 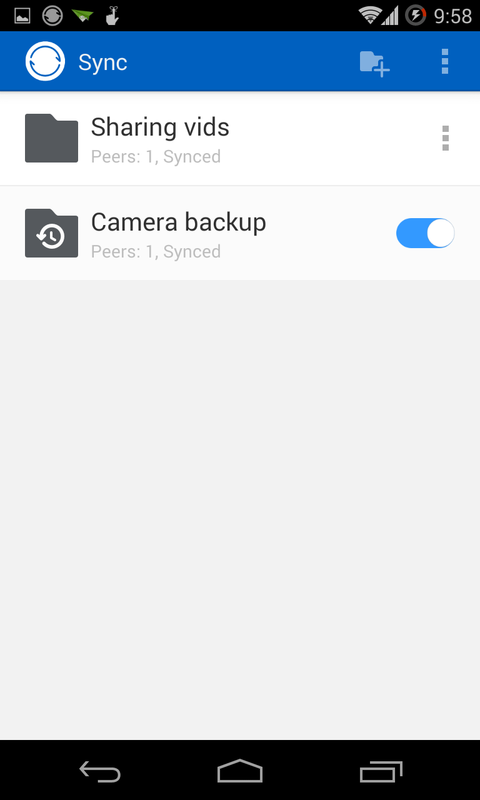 The new Sync also adds more per-folder controls including a variety of syncing preferences, a list of peers sharing your files, a disconnect button, and access to each folder's archive. Hover over a folder and select the three vertical dots on the far right to access this menu. 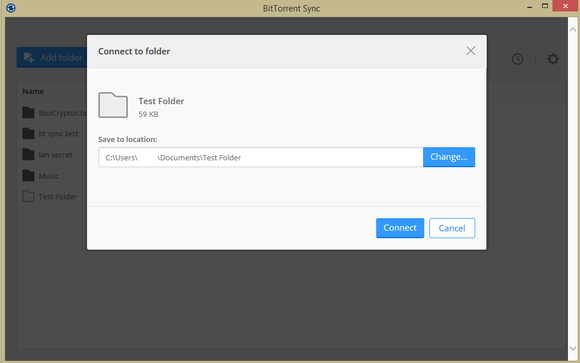 As with previous versions of BitTorrent Sync, you can't share individual files—only folders. To add a folder to Sync 1.4 click the blue Add folder button in the top left corner of the app. This opens an Explorer window where you can choose the folder you want to add to Sync. Once you've added a folder you're ready to share it with others. 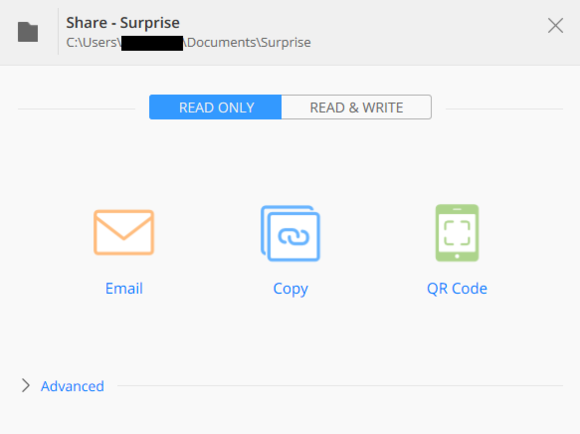 Hover over any folder in Sync and you'll see a new sharing icon, which makes it far easier to move data between devices than the old secret code-sharing method. Click the Share icon and a new window pops up with the choice to email or copy an app-specific link that will automatically open Sync on the recipient's computer. For mobile devices you still scan a QR code as before. By default, Sync offers read only sharing options, but you can click the Read & Write tab at the top of the sharing window to give someone full access to your folder. 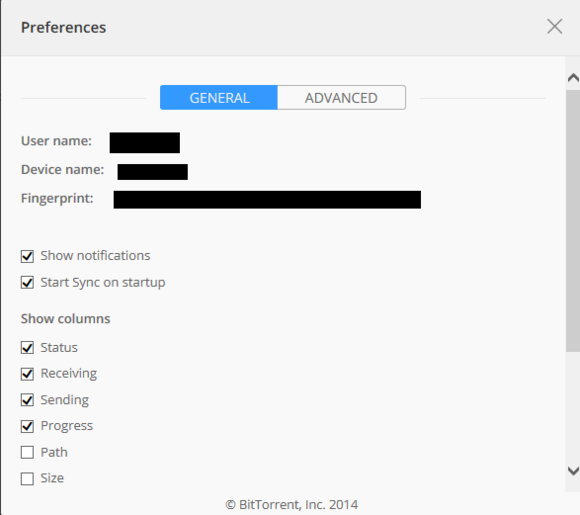 BitTorrent has also added a right-click context menu to the Windows system for even easier sharing. Just navigate to the folder you want to share in Explorer, right-click the folder, and choose one of the menu options. Let's say Jane wanted to email Bob a link to her Vacation Pictures folder. To start, she'd click the Share icon and then click the email icon in the window that appears. This will automatically open Jane's default mail client with a boilerplate message that Jane can edit to meet her needs. The subject line includes the name of the folder she's syncing and an app-specific link in the body of the message. Once Bob receives the email he just clicks the link in the message. If he has Sync 1.4 installed he'll be able to add the folder. If not, he'll be prompted to install Sync 1.4. Sync 1.4 automatically suggests where you should save folders others want to share with you. Even better for Bob, Sync now automatically offers a default location to save the folder that Jane wants to share with him. Before version 1.4 it was up to Bob to figure out where to save the folder. That often ended up with some confusing naming conventions and poor choices for saving locations. But Bob's journey isn't over yet. Once Bob accepts the link to Vacation Pictures and chooses a save location he won't start receiving data from Jane's PC right away. By default you have to approve recipients of your folders after they've accepted your sharing link. By default, anyone who accepts a Sync link doesn't automatically start receiving files from the sender. Instead, the recipient has to be approved by the sender after they've accepted the sharing link. In our example, Bob accepts the sharing link that Jane sent. Then Jane gets a notification letting her know that Bob wants to share her folder. Jane then approves that link to let Bob start syncing. Jane could also make extra sure that Bob is who he claims to be by taking a deeper look at the approval request. All requests appear at the top of the Sync dashboard. As you can see in the image above, Bob has decided on the username Sticky. If Jane wanted to she could just click the green check mark to immediately share her vacation pics. Sync helps ensure you're sharing your files with the intended recipients. If she was a little more concerned about security, however, she could click on Bob's user name. A pop-up window would then appear showing Bob's device name, IP address, and Sync device fingerprint. With Bob's fingerprint, Jane could call him up and read it back to him over the phone to make sure she's sharing her photos with the correct PC. 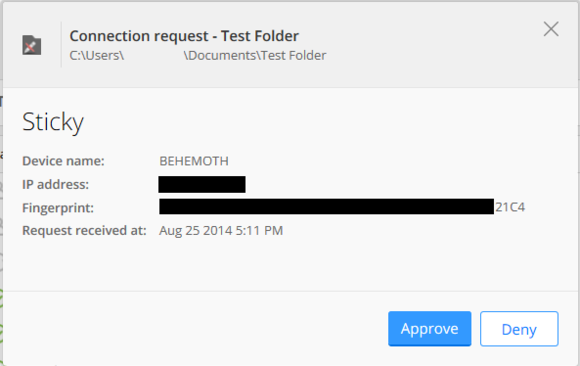 For the initial sender, approvals are something of a tradeoff for added security since you are sharing your personal files using insecure communication like standard email. Anyone looking for even more security could turn to encryption tools like PGP or miniLock. For the privacy conscious it may be a little concerning that Sync displays your IP address to other users. But on the other hand Sync is designed to share files with people you know and trust. Plus the chances of data leakage to third-party snoops are minimized as all traffic between devices is secured with 128-bit AES encryption and initial connections are secured with perfect forward secrecy. Going back to Jane's initial sharing window, underneath the three basic sharing options is an Advanced tab that offers three crucial settings. Click on Advanced and the first thing Jane sees is a check box set to make the sharing link expire in 3 days. If Bob doesn't use the link by then he won't be able to access Jane's photos. Jane could also adjust the time of expiry to any number of days she wants. Alternatively, she could uncheck the box and the link would never expire. Underneath that box there's also a setting to restrict how many times the link can be used. If Jane was sending the same link to five people, she could limit the link's use to five times. The last box "Peers I invite must be approved on this device" is the setting requiring approvals before sharing. To turn this setting off just uncheck the box. Also note that any folders shared with others under previous versions of Sync won't have approvals turned on by default. Like it's Windows counterpart, the Android version of Sync has also received a visual overhaul. 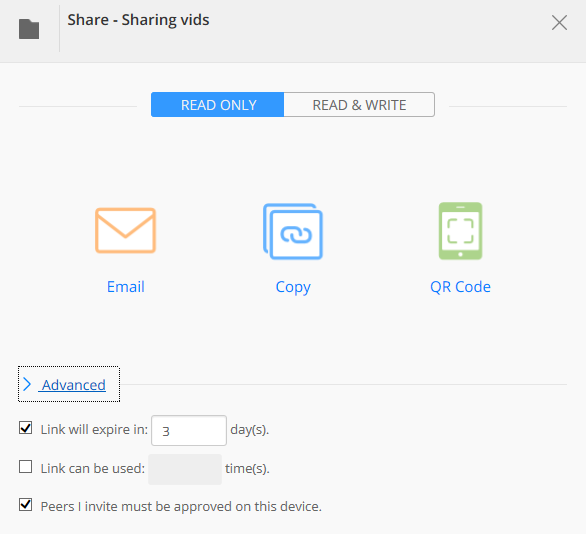 For the most part, the new version is much better and works similarly, including the new sharing method. The one thing I noticed that's a little different and somewhat non-obvious is sharing content (other than photos) from your Android device to a PC or other mobile device. There used to be an Add folder button in Sync 1.3, but that's gone with version 1.4. 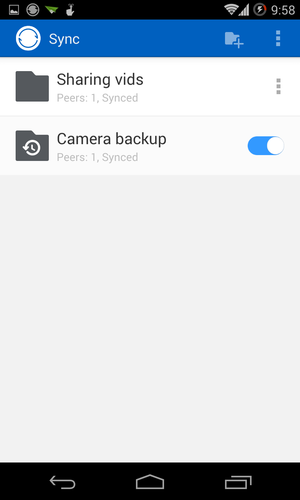 To share a folder on your Android phone or tablet, click the menu icon in the upper right corner (the three vertical dots) and select New backup. A new window pops up showing options to add the pictures, music, movies, or downloads folder to Sync. You can also tap Custom location to pick a specific folder in the file system. Once you've chosen a folder to share, you can send links around to other devices or friends just like with the PC version of Sync 1.4. Going the other way. Adding a folder from a PC to your smartphone is easy and requires the QR code scanning method just like previous versions of Sync. The major difference being Android users no longer have to choose a save location just like their iOS-using counterparts. Sync is still officially in beta and some users may run into bugs or instability issues iwith 1.4. 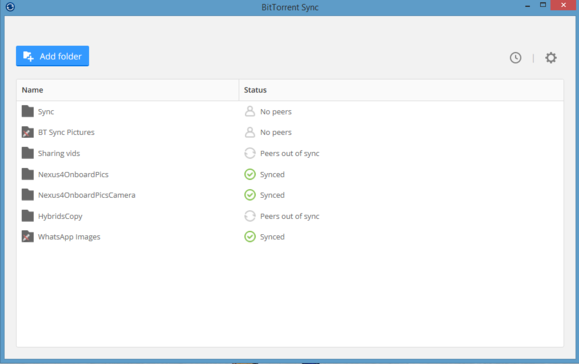 Nevertheless, Sync 1.4 is a solid update that is much easier to use and well within the grasp of everyday users.